Sandro Botticelli painted the Adoration of the Magi around 1475: at the time he was a young artist, protected by the Medici family. The work - a tempera on wood - was located in the church of Santa Maria Novella, in particular in the chapel of the del Lama family. Who commissioned the work? The banker Gaspare di Zanobi del Lama, who made built the chapel in Santa Maria Novella to atone for his sins. At the time, bankers\' work was considered similar to the sin of usury. The Medici family, which protected both the banker that the painter, is represented in the work. The three Magi - representing the stages of life - are Cosimo the Elder and his sons Pietro and Giovanni. We also see the sons of Piero, Lorenzo the Magnificent and Giuliano. There are also other characters, very important for the Medicean Florence: Giovanni Pico della Mirandola, Agnolo Poliziano and Botticelli himself, in a self-portrait, in the group of people on the right. The Uffizi artwork shows some stylistic characteristics of the mature Botticelli: in fact, he prove here that he has reached the loose and vigorous tract that characterizes his style. Even the characters, with their melancholy yet proud air, give a fairy-tale tone of meditation that we find in the best-known works. Botticelli also introduces some innovation in the composition, of which they will make treasure - among others - Leonardo da Vinci and Filippino Lippi. They produced other paintings on the theme of the Adoration of the Magi, now preserved at the Uffizi Gallery. Which innovations? 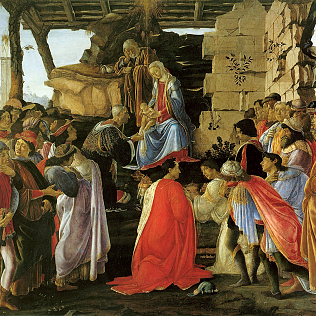 The Adoration of the Magi was already a popular theme among Italian painters. Botticelli introduced the frontal view of the represented scene. At the center there are the holy figures, which here are in a higher position than the others. On either side there are the other characters, arranged symmetrically. This is a less well known painting of the Spring and the Birth of Venus, but an important masterpiece in the career of Botticelli and in Italian art history.